Parks are interesting places in London. They’re a refuge for dog walkers, disenfranchised youths, creepy loners and nature enthusiasts. In winter they’re hopelessly desolate. In summer they’re often teeming with clusters of flat dwellers clustering around tin barbeques and trying to catch a few precious rays of sunlight before retreating back to their overpriced box rooms. 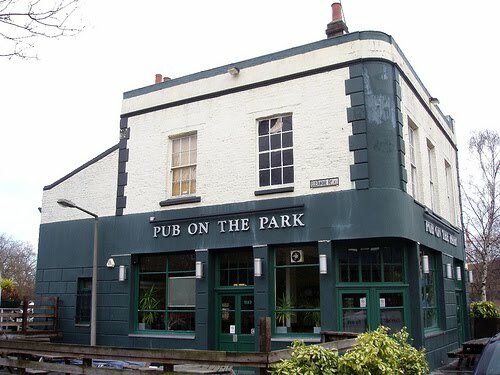 London Fields is one of East London’s most popular canine lavatories and this is where you will find the appropriately named Pub on the Park. There are good beer options, very decent food and usually a pretty sound crowd mooching around in this madcap building. It floats on it’s own on at the edge of London Fields with two of its sides encompassed by an enormous covered seating area which looks back out across the park towards Broadway and the Lido. My only teeny gripe with Pub on the Park is that it features an alarming number of screens which all too often are showing games where overpaid men are pratting about with a ball for the best part of two hours whilst a large crowd of over weight men sing them songs and go ‘Ooooo’ every now and again. Though these don’t ruin the pub the way they ruin the Prince Edward it occasionally (almost) puts me off a second pint. Given it’s right next to the train station you’d be a berk not to head here for a few beers. It’s a great gateway to some of the best bits of East London and you could do a hell of a lot worse than make this your first stop before heading off to Broadway Market, Brick Lane or Columbia Road Flower Market. The best Sunday Roasts ever! Certainly hard to beat I’ll give you that.